House Reuben ($11.00): House corned beef, Swiss cheese, bucket style kraut, caramelized onions and 1000 island on grilled rye. Included Side Items: Served with choice of fresh seasonal fruit, fries, cottage cheese, house chips or mashed potatoes & gravy. Presentation: The Reuben was on marbled rye with Swiss cheese lining both slices of bread. Atop the bottom slice of Swiss was a layer of sauerkraut and caramelized onions, followed by the corned beef, and then a layer of the 1000 island dressing under the top slice of Swiss cheese and final slice of bread. It was cut somewhat diagonally down the middle, and put on a rounded square white plate with the side item on one side and a dill pickle spear on its other side. 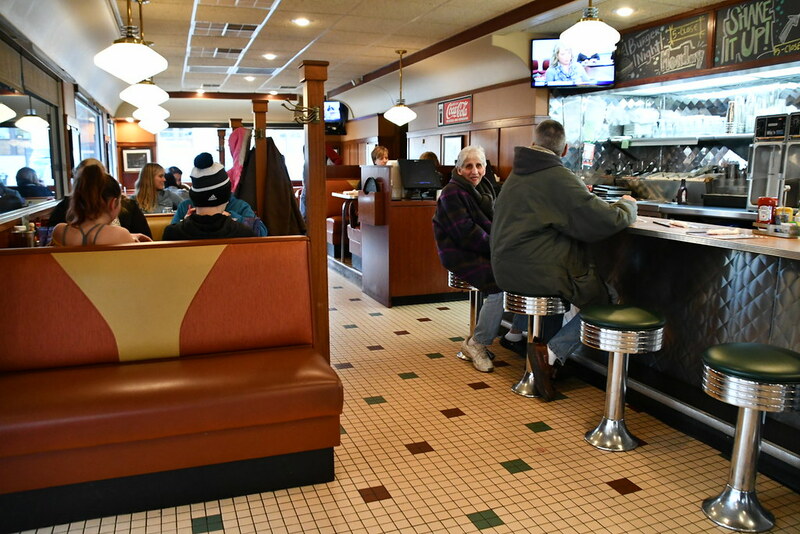 The Phillips Avenue Diner is a beautiful building, kind of a fusion of new construction with an older style chrome diner. The interior was immaculate. 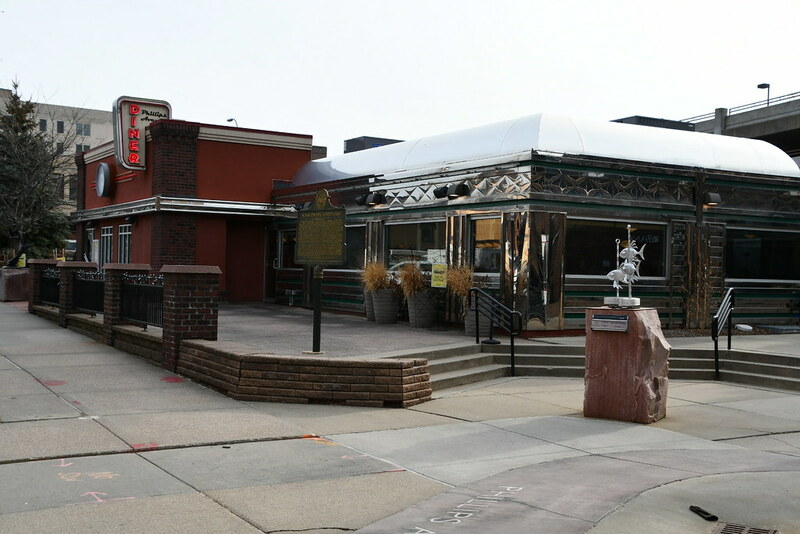 It's definitely a little more upscale than your normal diner, and it's located in the heart of downtown Sioux Falls. 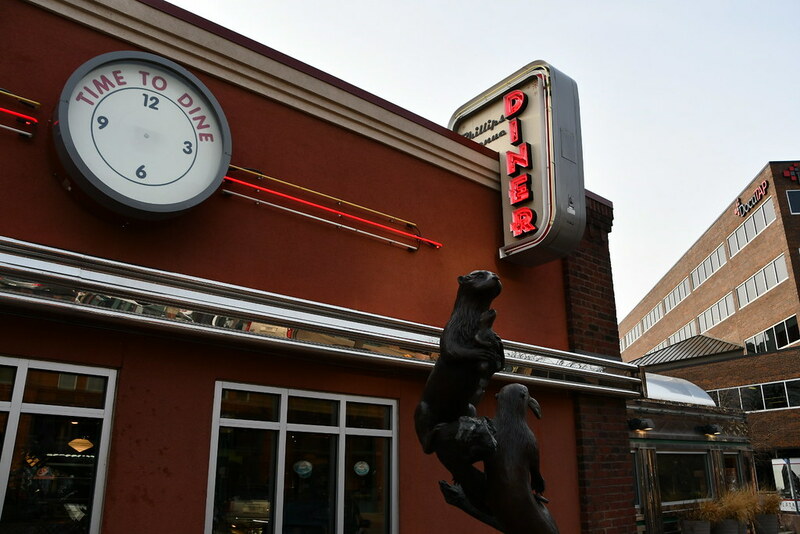 We had to park a block away at a parking meter and walk down to the diner. 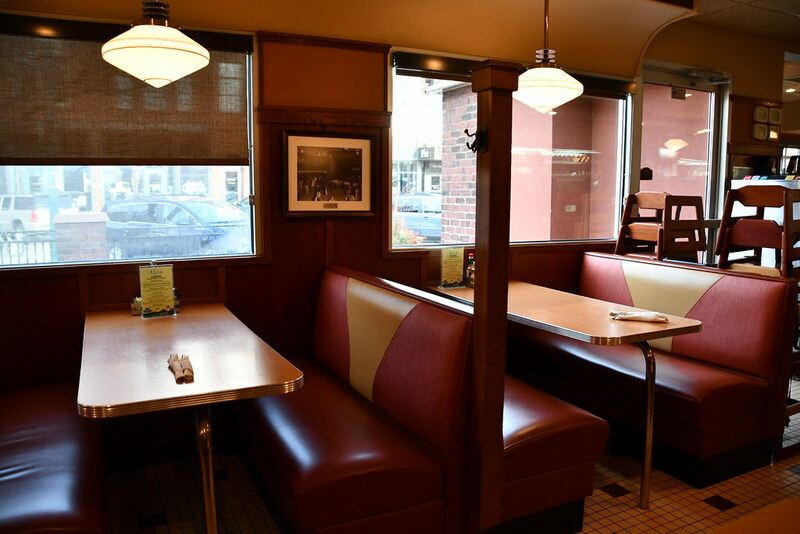 The booths were well appointed, and there was a little dining counter near the entrance, if you wanted to sit on a stool and watch the cook staff at work. The service we received was outstanding--very attentive but without hovering over our table. The food was brought out promptly and courteously. We were shown to a nice booth, where we ordered an appetizer of Poutine without the meat. They normally serve it with some type of pork. 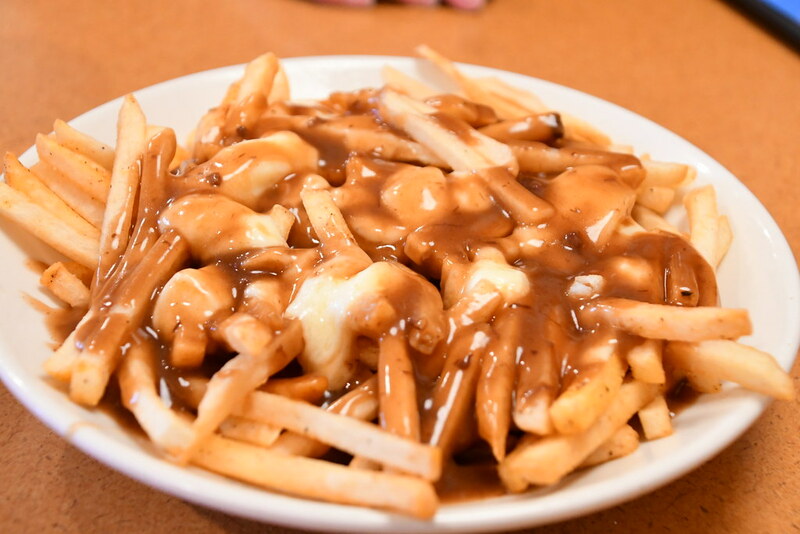 We both thought that the poutine was delicious! The cheese was nice and melty. It really was next best thing to being in Canada. It was delicious! I didn't read the menu description overly closely before ordering my Reuben. But when tasting it, it didn't take long to notice that there was something unusual about it. It seemed somewhat sweeter than normal. I think that the 1000 Island dressing was a little sweeter than I was used to, and there was a lot of it--but not so much that it made the sandwich soggy or overpowered the other ingredients. The rye bread was grilled just right, with just the right amount of firmness to keep the ingredients inside without feeling greasy or getting soggy. The corned beef was not a super thick layer like some Reubens, but it was completely appropriate. There were pieces of corned beef falling out of the sandwich onto the plate, which was a good sign. The beef had a good flavor with deep overtones. Each bite of the sandwich was nicely balanced and it had a nice juicy flavor. 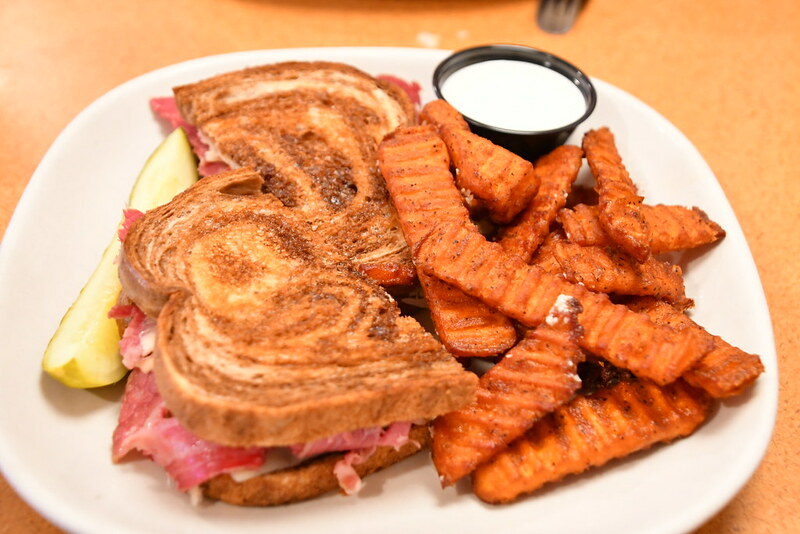 At first, I had attributed this to the dressing, but then, after reading the menu description again, I determined what I think may be the unorthodox secret to the deliciousness of the Reuben at the Philips Avenue Diner: the caramelized onions! I don't think that in all of the Reubens I've eaten from different restaurants around the country that I've ever run into a Reuben that boasted caramelized onions. But something about the bitterness of the sauerkraut mixing with the sweetness of the caramelized onions made this a heavenly sandwich that I really want to try again. I'm going to have to remember the caramelized onions and see if I can add that to the Reubens I make at home. This sandwich comes highly recommended! I ordered the sweet potato fries, for a $1 upcharge, and they were good. They came with a ranch dipping sauce, but I gave that to Katherine for her traditional style fries. Also, the pickle spear was just the right size and had a good dill flavor. 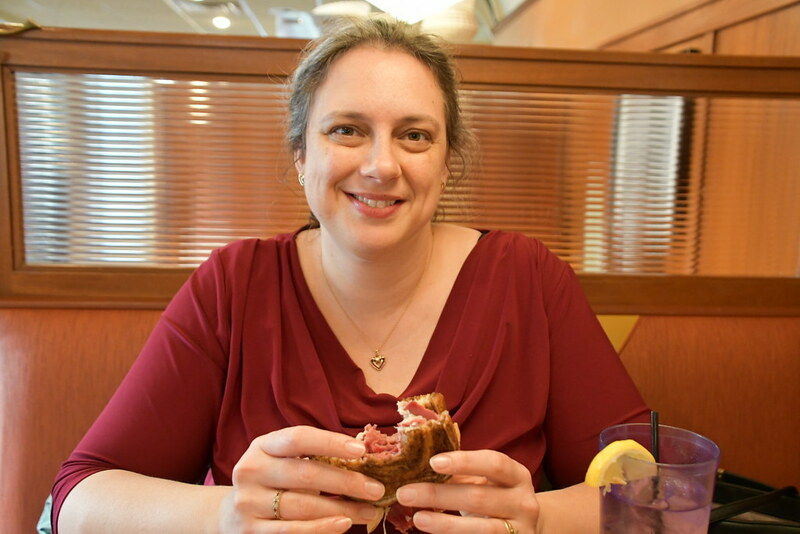 Katherine enjoying her Reuben sandwich. 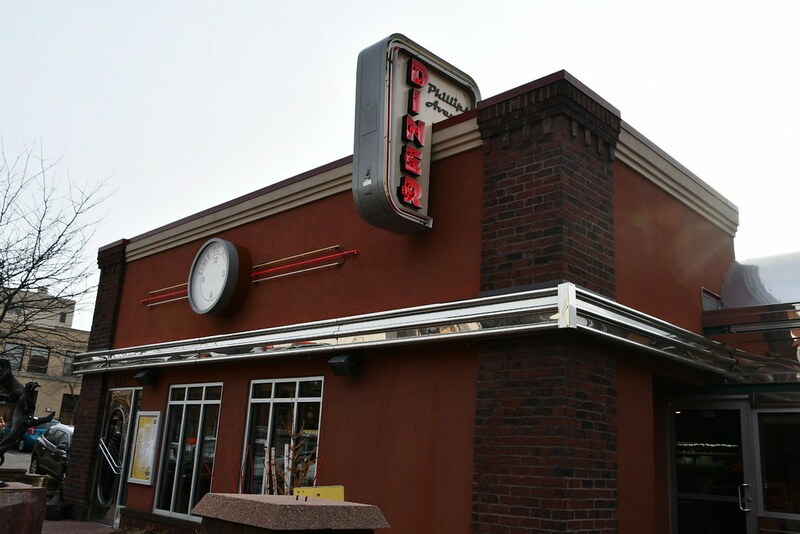 There is a lot of public art installed along Phillips Avenue near the diner. Right in front of the restaurant is this sculpture of otters at play.